LTC Jimmie L. Cole, Jr. is the Second Commander of 1/278th Armored Cavalry Regiment, Tennessee Army National Guard since it’s reorganization in 2006. LTC Cole formerly served as the Commander of the 278th ADA Btry, 278th ACR reorganized as the Regimental Reconnaissance Troop, 278th Regimental Combat Team for service in Iraq. 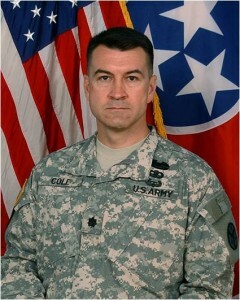 LTC Cole received a Bachelor of Science degree in Accounting from Louisiana State University in 1989. He was commissioned Air Defense Artillery from OCS, Fort Benning, GA in 1991. His military education includes the ADA Officer Basic Course Fort Bliss, TX in 1991, the Finance Advanced Course Fort Jackson, SC 1996, Scout Commander Course, Airborne, Air Assault, CAS3, Command and General Staff College, and Infantry Pre Command.